So what’s been up with me lately? 1. Watching the rain. The weather has been CRAZY for that past two weeks. We’ve been getting these waves of thunderstorms that can last the entire afternoon or evening. Fortunately rain=cooler weather. Right now this “cold front” means it is 80 degrees. Yay? Unfortunately storms at night=freaked out dog that keeps me awake. You win some, you lose some. 2. Running in said rain. Last night I needed a break from my normal weight training vs. treadmill/stairmaster intervals and decided to go for a walk outside. I hooked up my Iphone, turned on the iHeartRadio app, and began listening to some tunes from my local station. 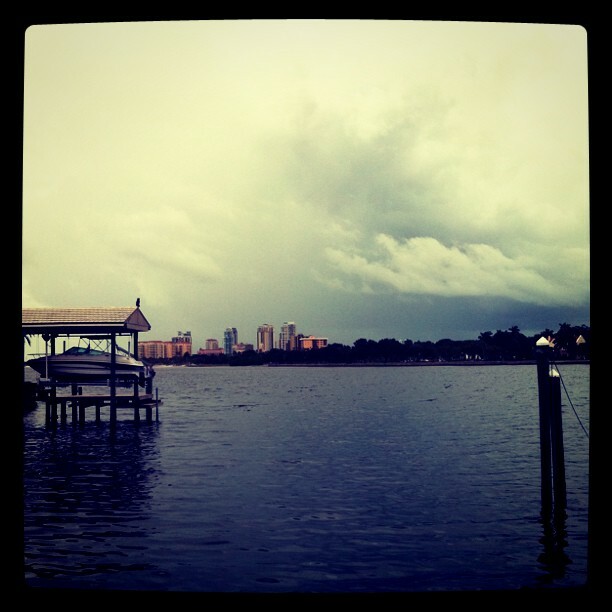 As I was turning back home, I noticed approaching ominous clouds, took some pictures and started to jog back. Then, the sky opened up and I freaked… MY PHONE CANNOT GET WET. So I balled my phone in the band of my pants and awkwardly sprinted home, stopping to rest below trees while gripping my phone to my side. Yes I got a cramp. Yes I was soaked. Yes my phone stayed dry! Success! I finished my workout off inside with 20 minutes of alternating between jumping rope and holding planks. More success! 3. Eating. I eat a lot and I eat good food. 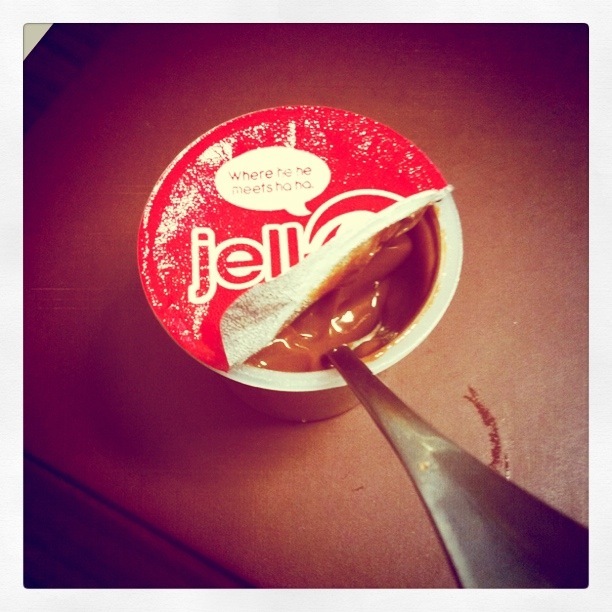 Chocolate pudding is part of my life right now and it is tasty. 3. Attending the first UF football game of the season. 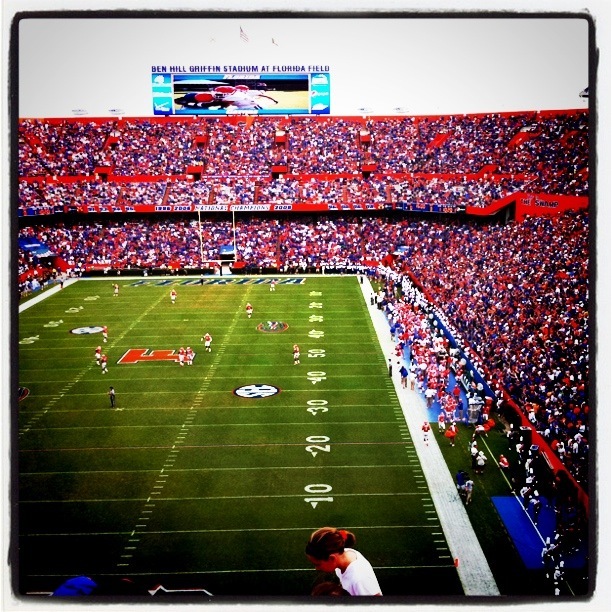 This weekend I drove up to Gainesville to see my first real college football game with Morgan. After an afternoon of tailgating (strangely as the only person of age, I was the only person not drinking…), I watched a lively game and did the Gator Chomp with the entire stadium. It was electric. 4. Found quirky things in Gainesville. The morning after the game, Morgan gave me a tour of the UF campus and brought me to a great lunch spot. 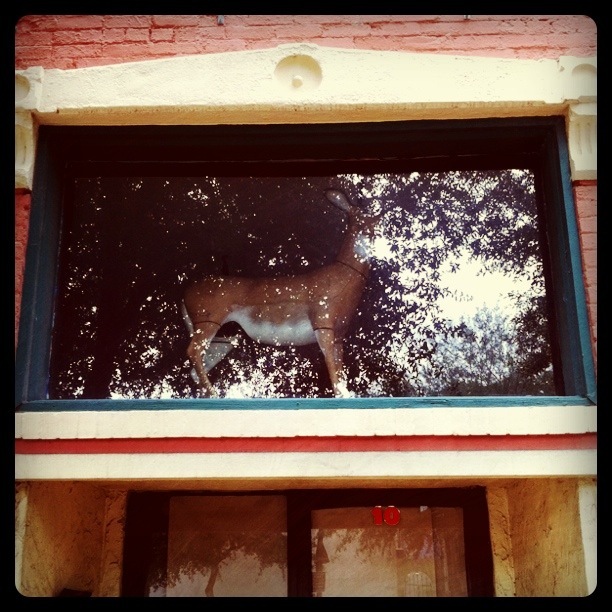 We also found this closed down storefront with a fake deer in the storefront window. 5. 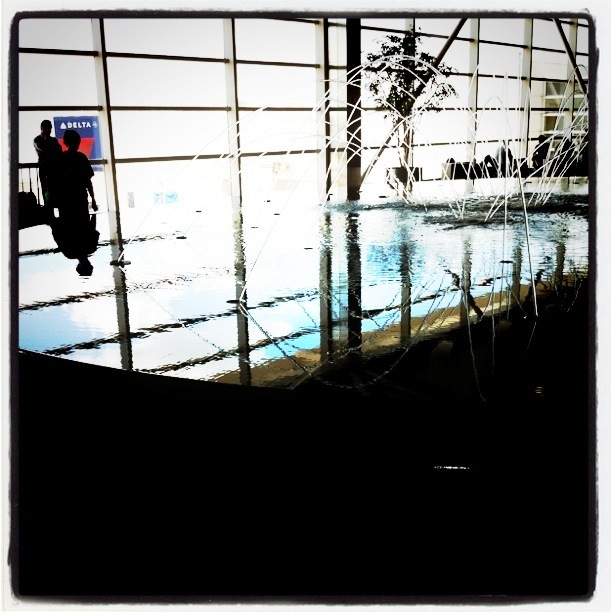 Found pictures on my phone from my layover heading to China. 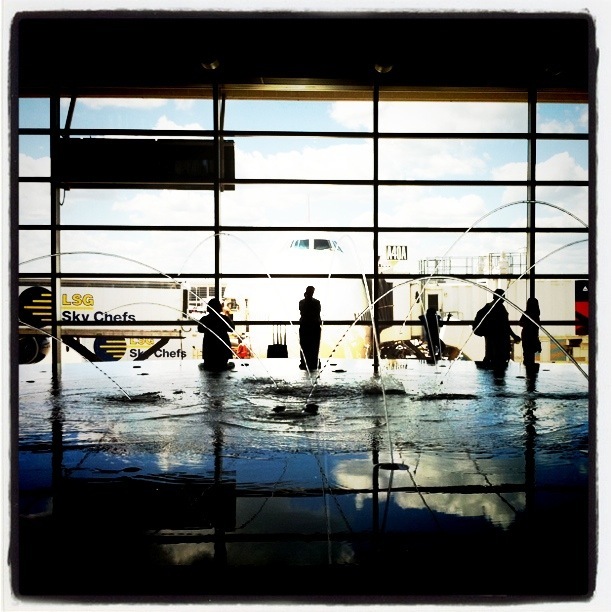 Very cool pictures of a fountain in the Detroit airport. 6. And finally the news you have been waiting for. I am studying to become a certified personal trainer! After becoming more and more interested in fitness and weight training and missing school just a bit, I asked my own personal training about the certification process. He highly recommended the ACE at-home study set and gave me the confidence to dive in and just do it. I’m still working full-time in addition to volunteering at the Dali Museum and singing in an adult choir. I try to study on my commute home from work, in the evenings, and on the weekends. But the thing is, I LOVE LEARNING THIS STUFF. Yes it is difficult (hellooo anatomy!) but so interesting to me. In college I trained a couple of my girl friends and had a great time educating them about fitness and getting them in better shape. Who knows exactly what I will do with this certification but it will be great to have in case I end up traveling more in my life, need something extra, or end up pursuing personal training as a career. I don’t know, but I am excited to learn and willing to share my journey. I just started studying and will take the certification exam in January 2012. I have created a page for my personal training and will post updates on what I’m learning, how I’m applying it to my own training and exercise, and any new developments along the way. Although phone protection is a must, I love getting caught in a warm end of summer rain during a job. Great pics! Thanks, I’m glad you enjoy the photos! Yes running in the rain was actually extremely pleasant and refreshing… but the phone situation was less than ideal. 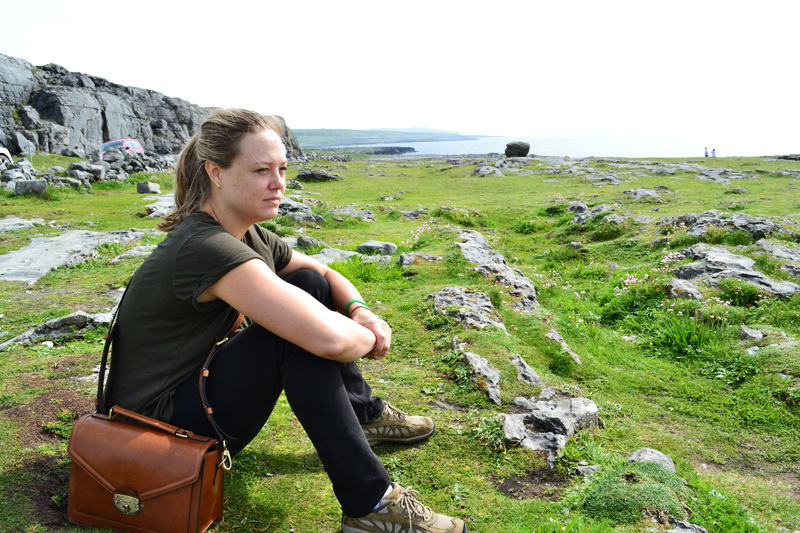 Next time it might be better to listen to the beat of my feet.